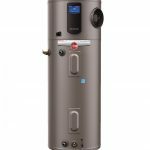 Rheem direct vent gas water heaters and power vent water heaters use outside air for combustion, offer longer venting options and energy efficiency. We are pleased to quote right over the phone or over email. Simply call or fill out the free estimate form by clicking below. In order to give you an accurate estimate, please send us the following information about your existing water heater. Break out that tape measure! Where is the tank located in your home? What kind of fuel does it use? If natural gas or propane, what type of venting does it use? Venting goes straight up from tank and ties into your furnace vent or through your roof. Venting goes straight up and then turns 90 degrees and exits through the wall. A powered fan on top of the tank forces exhaust through a pipe and out a side wall. Does your current water heater have metal straps like the ones illustrated here? If you can, take two photos of your water heater and upload them here. Take a few steps back and get a photo of the whole tank and area around the tank. This helps us know what to expect for installation. Get a close-up of the tank's labeling. There should be a sticker on the tank that has model numbers and serial numbers. Get a clear shot of that inforamtion. With the above information, we are able to provide a complete and accurate quote with all costs included. Adjustable coaxial vent allows flexibility of installation, can swivel 360 degrees and uses outside air for combustion and requires no electrical power. Well insulated for reduced stand-by heat loss performance. Aluminum vent and cap base to prevent staining of building exterior. Longer venting for flexibility in installation. Now up to four feet above the water heater and four feet from an outside wall. Vertical options available. Guardian System™ & sensor keeps you safe by preventing vapors from accidental ignition. Exclusive air/fuel shut-off device. No filters to clean, the Rheem EverKleen system fights sediment build up. Patented magnesium anode rod with resistor protects the tank from rust. What should I expect leading up to the Rheem Fury direct vent water heater replacement? Our Customer Care representatives will work with you to answer a few simple questions about your existing water heater and provide a Complete Quote including installation, gas piping, venting and other costs. This will provide you with the full price of the water heater, installed. We will provide this quote in writing via email. We always arrive on time on the installation day you scheduled. 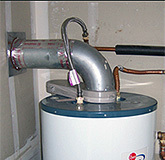 Water heaters can often be scheduled for same day installation. To protect your home, we take the time to protect the surrounding work area. We always promise to clean up after we install your water heater. Lastly, we inspect the new equipment with you and review proper maintenance procedures and warranty information. What is a direct vent water heater and how do I know if I need one? 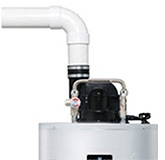 The direct vent gas water heater looks like it has a pipe sticking out of its head. 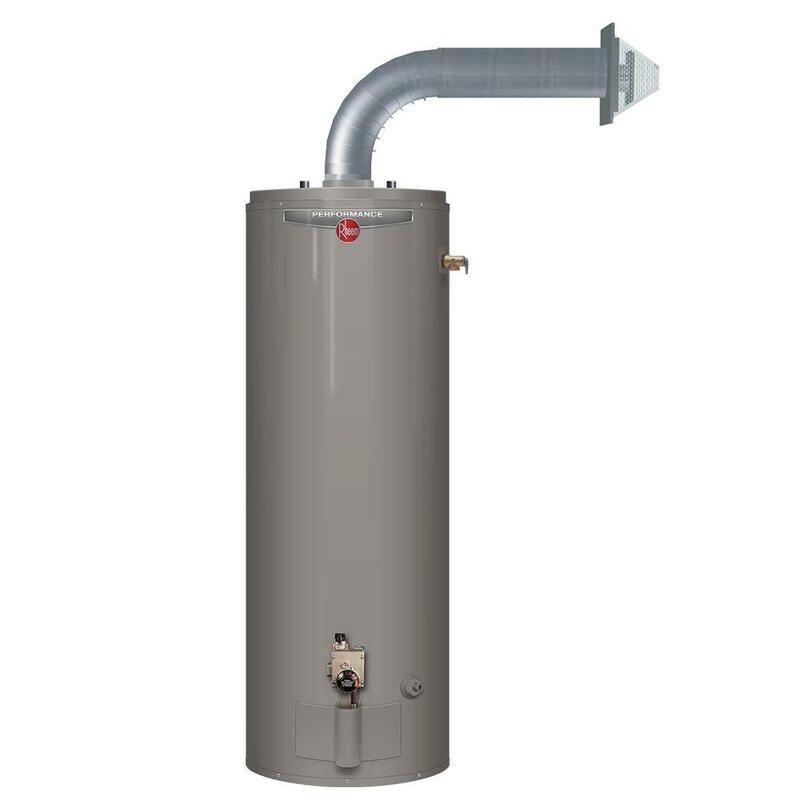 It is a gas water heater that has a venting pipe that goes right from the water heater out the side of the building or in some cases, up a chimney to a roof vent. So it “directly” vents right out of the house. 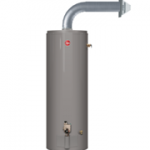 With its closed and tightly sealed exhaust system, the Rheem direct vent water heater sends one pipe through the wall outside to both draw in air for gas combustion and expel toxic exhaust. Combustion, in a water heater, is the burning of natural gas to heat water. A gas water heater needs plenty of air for this combustion, and using air from the outside is energy efficient. The alternative would be for the water heater to draw air from inside the house, pulling in air that you just used electricity and/or gas fuel to heat or cool. With the direct vent, you avoid this added fuel use, and cost. And your furnace or air handler doesn’t have to work as hard. Usually, if you have a direct vent already installed, you will need to replace it with the same type of water heater. 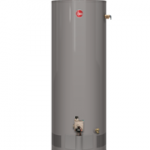 However if you are just getting gas to your home, our Seattle water heater specialists can work with you to determine which type of gas water heater is needed for your location and gas line size. 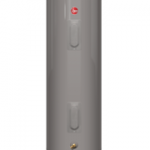 What is a power vent gas water heater? 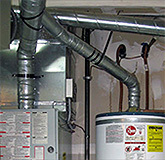 The Rheem power vent water heater is most often used in situations where a direct vent needs a longer distance to vent. That happens, for example, if the water heater is in the interior of the house, nowhere near an exterior wall, perhaps in a closet. Then you will need the power vent water heater. It has a powerful blower fan that can push the harmful exhaust gases out of the house through its vent. This can work at long distances of up to 100 feet, hence the name “power vent”.